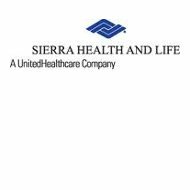 This Sierra Health Insurance review pertains to California-based Sierra Health and Life, an insurance company established in 1906 and acquired by Sierra Health Services in the mid-1980s. The company is part of the United Healthcare Services family of companies. United Healthcare is one of America’s top five national health insurance carriers. Sierra Health and Life is licensed to transact business in 43 states as well as the District of Columbia. Receive quotes from health insurance companies by entering your zip code now! Sierra Health and Life offers health insurance programs in four categories. The first category is their Medicare coverage, which provides supplemental coverage alongside federal Medicare policies. This supplemental coverage includes a prescription drug plan to fill in any gaps left by Medicare. It is sold to individuals directly from the company or one of their brokers. The other three categories include individual plans, family plans, and employer group plans. A major portion of this company’s business is the health insurance it offers through employers and other groups. This insurance is typically an HMO-based plan, which covers routine doctor’s visits, prescriptions, and emergency care services. It also covers major medical and hospitalization up to predetermined limits. Employers will offer this health care coverage as part of an overall benefits package provided to employees. Parts of the Sierra Health coverage will be optional, based on employer needs and preferences. For example, one employer may choose to include vision and dental insurance while another chooses not to. This type of flexibility allows employers to have more control over the benefits they offer which, in turn, helps them control their costs. It’s not at all uncommon for employer-based insurance to work this way. In relation to individual and family policies sold directly by the company, each customer also has some options as to how much coverage he or she desires. Yet regardless of whether insurance is acquired from the company or through an employer, it is a PPO-based operation. That means Sierra Health and United Healthcare have established a network of doctors, hospitals, and clinics that participate in the program. Policyholders are expected to use these providers whenever possible, receiving reduced rates as incentive to do so. It’s difficult to say exactly where all of the company’s offices are located. Not only are they part of United Healthcare, but they also have a nine subsidiaries operating underneath them. A brief perusal of Internet records indicates there are regional offices located in various strategic locations around the country. Whether these offices belong to Sierra Health directly, or one of their nine subsidiaries is hard to say. Nonetheless, we have listed the address and telephone number of their corporate headquarters below. Like all of the companies in the United Healthcare organization, Sierra Health works with independent brokers throughout the country. Brokers wishing to represent Sierra are encouraged to visit the company’s website, read the information they provide, and download an application. Note that not all Sierra Health products are available in every state where they transact business. Individual brokers will be restricted according to the products offered in their areas. Sierra Health is committed to the good health and well-being of its policyholders. Therefore, the company strongly encourages preventative medicine and a healthy lifestyle. Their website offers several resources to help policyholders achieve these goals as best they can. One of their programs, known as the Passport to Healthy Living, is readily available free of charge on their website. Members can download the information and get started with the program immediately. For claims service, Sierra works like most other health insurance providers in that customers are expected to make their co-pay at the time service is rendered. The health care provider will bill Sierra Health directly for the remainder of the balance. In some cases of major medical, policyholders may have to pay out-of-pocket and then file any reimbursement claim afterward. You should consult your policy documents for details about this type of transaction. As part of their customer service, Sierra Health provides an online help center plus a 24-hour, toll-free telephone number staffed by licensed nurses that can offer advice to policyholders. The company also provides a range of educational programs designed to encourage good health and well-being. Information on all the services can be found on the Sierra Health and Life website. Need to find health insurance? You’ve come to the right place! Enter your zip code to find a plan that suits your needs.